I just think this dish in the photo is so cute. When I saw this dish in the store, I just had to get it. I couldn’t think of what I’d ever use it for, but this 2″ wide plate was only .69¢. I finally found a use for them with this recipe. 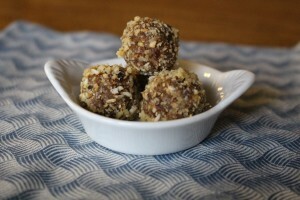 I’ve seen many of these date ball recipes floating around Pinterest and the internet. Basically a bit-sized take on Larabars. I’ve had Larabars in the past, but I can’t have them now because basically all of them have almonds in them. There was always something about them though that was overwhelming, and I think it was the sweetness and flavor of the dates. That is why something that I think is essential to this recipe is the toasting of the coconut and nuts. 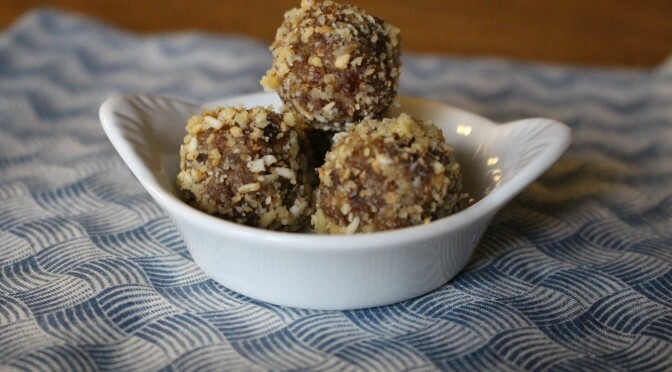 It tones down both the sweetness and flavor of the dates, and makes them into a delicious bite-sized treat. This is a pretty simple recipe. First pulse the nuts, and then add the rest. The only trick is with the dates. It may seem like you need to add more dates or oil to get it to come together, but just keep on pulsing. It will come together. This is the consistency the mixture should look like once everything is added. 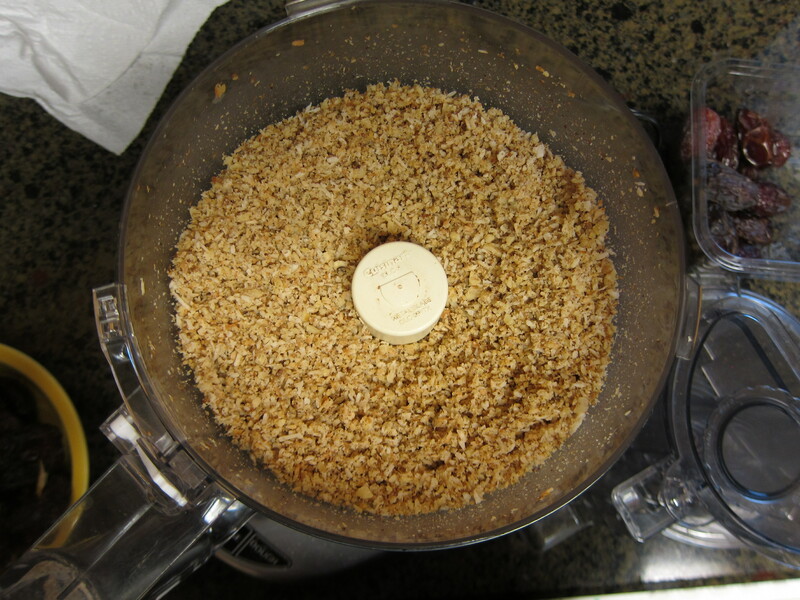 Place toasted coconut, toasted walnuts, and salt in food processor. Pulse until roughly ground. Take 3/4 cup out and set aside in a small bowl. 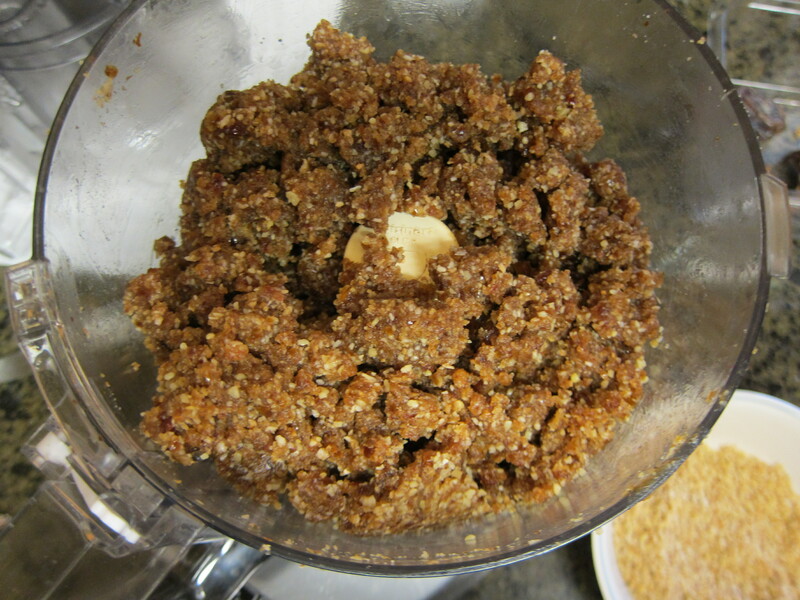 Add dates, vanilla, cinnamon, and melted coconut oil to the nuts remaining in the food processor. Pulse until combined. Form into 1-inch balls. Roll in reserved nuts. Place on parchment paper. Store in the freezer. 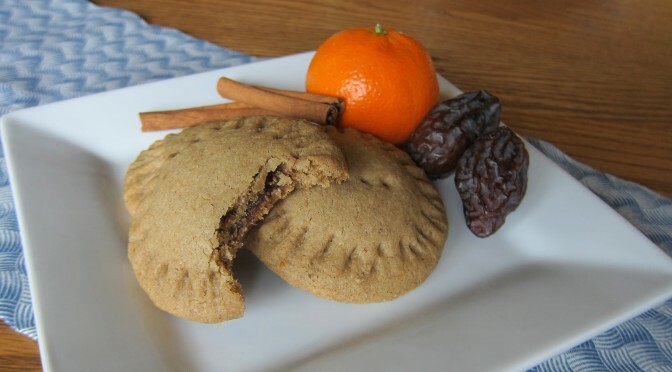 This is another recipe I made for my sugar-free mom. When she and my dad were going prepping for a road trip, she realized she could no longer have her usual Werther’s and Turtle Chex Mix to snack on while driving. I just divided them into snack bags, 5 to a bag (these are addictive, so it’s important to have portion control). They were a hit. One of the best Christmas presents I ever got was a cookbook that my Grandma L made for each of her grandchildren containing all of her recipes. It is such a treasure. I especially like how she would write comments in them, or telling the story about the recipe. 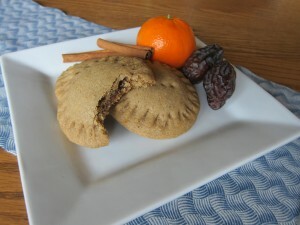 I was looking through all of the recipes the other day and came across this recipe for Date-Filled Cookies. The part that grabbed my attention was what she wrote after. This gets me not only because of the comment about specifying the type of date she was referring to, but I also like the mention of Papa. Because he passed away when I was barely 4, I never really knew him, nor do I have any real memories of him. So with this recipe, I saw an opportunity, in a very small way, to connect to him. Place dates, water, and sugar in a small pot. Bring to boil, then reduce to simmer and cook for 5-8 minutes. Remove from heat and stir in orange zest and cinnamon. Set aside to cool (I wanted a smoother texture, so I used a stick blender to smooth it out). In a small bowl, whisk together flours, starches, xanthum gum, baking soda, and salt. Set aside. In a large bowl, cream shortening and sugar. 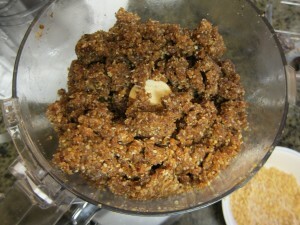 Mix in vanilla extract, flax seed mixture, and orange zest. Slowly mix in dry ingredients. Refrigerate for at least one hour. Preheat oven to 350 degrees. Roll out dough between two sheets of parchment paper until 1/4" thick. Cut into 2 inch rounds. 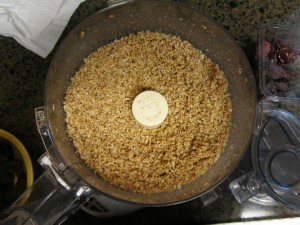 Place a heaping 1/2 teaspoon of filling in center of one round. spread filling to within 1/2 inch of edges. Top with another round and use a fork to crimp the edges. Cook in preheated oven for 8-10 minutes, until edges are set. Cool on pan for a few minutes before transferring to cooling rack to cool completely. I did change the recipe a little bit (other than the obvious to make it gluten-free). I used less sugar (if you can believe it), and did away with the eggs. I also changed the recipe by adding some orange zest and cinnamon. I wonder what my Papa would’ve thought of these.